• Knockin’ on Bob’s Door showcases The Persuasions’ highly individual a cappella takes on Dylan’s classic 60s and 70s songs  all deeply ingrained into the collective memory of generations of music lovers. The Persuasions’ inimitable gospel-driven sound is intact, with Jimmy Hayes and Joe Russell from the original 1962 line-up on this recording. mmy Hayes and Joe Russell from the original 1962 line-up on this recording. • Founded in 1962 in Brooklyn, The Persuasions have been New York’s and America’s leading A Cappella vocal group for many decades. After their special guest role on the ZOHO’s recent “TRIBUTE TO J J CALE Vol 1 The Vocal Sessions”, Knockin’ on Bob’s Door features the band’s unique take on 14 of the classic 1960s songs by Bob Dylan. • Following their unique tradition of recording successful tribute albums to major Rock icons since the year 2000 (The Grateful Dead, Frank Zappa, The Beatles, U2), The Persuasions, by repeated audience requests, had set their sights on Dylan’s most famous songs from the 1960s  all of them deeply ingrained into the collective memory of generations of music lovers around the world. • The Persuasions’ inimitable sound is intact, with two group members Jimmy Hayes (bass) and Joe Russell (second tenor) from their original 1962 line-up still with the band, and on this recording. Raymond Sanders (first tenor) has been member of the Persuasions since 1996. Bernard "BJ" Jones, a past member, has appeared on several Persuasions recordings. Latest arrival in 2003 was Dave Revels, taking over as lead tenor and as artistic director and arranger for the group. • Frequent live appearances of The Persuasions, particularly in New York’s B B King’s Club on 42nd Street and Times Square. The Persuasions are one of the unique sounds in American popular music in the second half of the 20th century and beyond. Their blended five-part harmonies are respectfully looking back to the tradition of the great gospel groups such as the Golden Gate Quartet, and the Blind Boys of Alabama. But they also have been hugely influential to the Motown group sound of the Temptations, Four Tops, Boys II Men and many others, all the way to newer R & B a cappella groups such as Take 6 and Rockapella. Astonishingly, the group will celebrate its 50th anniversary in 2012 which is nothing less than a miracle in today’s fast-changing, instantly downloadable world. The Persuasions’ inimitable sound is intact, and two group members Jimmy Hayes (bass) and Joe Russell (second tenor) from their original 1962 line-up are still with the band, and on this recording. Third member is Raymond Sanders (first tenor), member of the Persuasions since 1996. Bernard "BJ" Jones has been a past member of the group who has appeared on several Persuasions recordings. Latest arrival in 2003 was Dave Revels, taking over as lead tenor and as artistic director and arranger for the group. This recording also features guest vocals by Cliff Dawson on several tracks. Of their back catalog of dozens of LP and CD releases over the last 40-plus years, many of them are now regrettably out of print. During their last several releases in the past ten years, the Persuasions have developed a distinctive style of “Tribute” recordings. Each of these projects translates the songs of one of the great, iconic Classic Rock songwriters or bands into the Persuasions’ own-gospel driven, characteristic a cappella style. Beginning with the hugely successful “Might as Well- Tribute to the Grateful Dead” in 2000, several other tributes followed  to The Beatles, U 2, and  astonishingly  Frank Zappa! Following several years of no new recording activity, the band’s return to the studio began auspiciously in 2009 when the Persuasions graciously agreed to contribute two songs to ZOHO’s multi-artist TRIBUTE TO J J CALE project. Intentionally slightly cast “against character”, the group managed to infuse an emotional depth and gospel-like intensity to songs by an artist who is primarily known for his bluesy, laconic, laid-back and rootsy style. 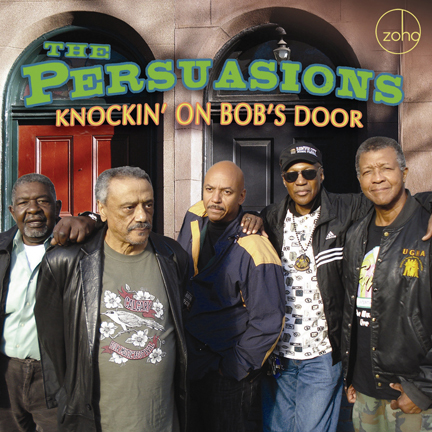 KNOCKIN’ ON BOB’S DOOR thus continues the band’s impressive series of Tribute recordings, as the Persuasions’ first full-length CD project for ZOHO. Given an entire universe of great songwriters to choose from, the songs of Bob Dylan were an immediate and obvious choice for both band and label. We decided to concentrate the repertoire selection to Dylan’s most famous songs from the 1960s  all of them deeply ingrained into the collective memory of generations of music lovers around the world. As on all of the Persuasions’ Tribute records, it is absolutely fascinating to hear how the musical worlds of (in this case) Bob Dylan and The Persuasions creatively collide- in most cases with the songs reduced to their bare harmonic and melodic essentials, of course without the electric guitars, harmonicas, keyboards and drums which one might have thought essential in any new versions of these classic songs. The opening track Mr Tambourine Man  a huge Billboard # 1 hit for The Byrds in 1965, then an album track on Dylan’s “Bringing It All Back Home” LP of the same year  lets the Persuasions shine with their crisp, tight harmonies, reveling in the surrealistic imagery of the lyrics. The percussive vocal effects The Persuasions are employing on All Along the Watchtower, suggesting everything from jungle sounds to New York City traffic noise, need to be heard to be believed. Like a Rolling Stone is viewed by many as Bob Dylan’s single greatest and perhaps most revolutionary song, from his 1965 LP “Highway 61 Revisited”. The Persuasions have the “cheek” and audacity to replace the thundering three cord riff and classic hard rock band sound of the original with a classic Brooklyn doo-wop vibe with an occasional vocal Reggae tilt  which, once heard, sounds completely natural. We dare speculate that The Persuasions’ highly original version of this song will become a classic in its own right. Don’t Think Twice It’s All Right  a song from his second LP “The Freewheelin’ Bob Dylan” from 1963  here gets a stately ballad-style treatment with the gruff, but magic lead vocals by Joe Russell, one of the band’s original members, and his only lead vocal on the entire record. The contrast to the next track, Quinn the Eskimo (The Mighty Quinn), could not possibly be greater  with the Persuasions hilariously mimicking the sounds of an amateur brass band playing at a party!  Dylan first recorded this song with The Band in the famous 1967 “Basement Tapes” sessions. Blowing in the Wind  also from Bob Dylan’s second LP “The Freewheelin’ Bob Dylan” from 1963  has been alternatively described as a “protest” song, and as an anthem of the early 1960s civil rights movement. The Persuasions’ version completely does justice to the song’s sincerity and idealism, by treating it as a spiritual, with heartfelt lead vocals by Raymond Sanders. Positively 4th Street  another Dylan song recorded during the “Highway 61 Revisited” sessions in 1965, but instead released as a single to follow “Like a Rolling Stone”, shares some of the bitterness of tone with its famous predecessor. Dave Revels on lead vocals wisely does not try to outdo Bob Dylan in his snarling delivery of the lyrics, but instead presents the songwriter’s anguished message plainly and sensitively to the listener. You Ain’t Going Nowhere is another song from the famous 1967 Basement Tapes, although it saw its first commercial release by a version of The Byrds in 1968. The Persuasions develop a light, almost swinging groove with this song. When I Paint My Masterpiece is a 1971 Dylan classic in which he humorously describes his experience as an aspiring “painter” in Europe. Here, the song gets a wry, gently swaying treatment, with bassist Jimmy Hayes taking his first solo vocal turn on this album. Jimmy is smoothly singing/talking his way through the ironic lyrics. Lay Lady Lay is one of the lead tracks on Dylan’s 1969 LP “Nashville Skyline”, and a successful Billboard-charting single. It has always been one of Dylan’s more remarkable songs, featuring a descending chromatic chord progression which gives the songs its ethereal, softly floating character. The Persuasions are clearly reveling in the harmonic richness of the song, topping it off with another understated, but stunning lead vocal by bassist Jimmy Hayes. Just Like a Woman is the only song on this compilation from Dylan’s epochal 1966 double LP “Blonde on Blonde”. The song was allegedly inspired by New York socialite Edie Sedgwick, although it has also been interpreted to have been written about Dylan’s relationship with folk singer Joan Baez. Dave Revels turns in a soulful, yearning lead vocal. Things Have Changed is a song featured in the movie “Wonder Boys”, and was released by Dylan as a single in 2000. He won his first-ever Oscar for this song in 2001. In his Oscar acceptance speech, Dylan said, “This song … does not pussyfoot around, or turn a blind eye to human nature”. Indeed, it doesn’t, nor does the Persuasions’ version, driven by a laconic, world-weary lead vocal by bassist Jimmy Hayes. The song Forever Young was first released on the Dylan & The Band release “Planet Waves” from 1974. Stylistically, the song can be described as a blessing from a parent to a child, reflecting the fact that Dylan had become a father himself during the prior years. The Persuasions beautifully catch the stately, intimate character of the song. The album’s final song Knockin’ on Heaven’s Door was written by Dylan for the 1973 Western movie “Pat Garrett and Billy the Kid” where it describes the feelings and thoughts of a deputy sheriff about his mortality. A song of deeply resounding spiritual power, the Persuasions celebrate the song with rich gospel undertones, crowned by a deeply sensitive lead vocal by bassist Jimmy Hayes. Produced by Jimmy Hayes, Dave Revels and William Weist. Vocal Arrangements by Dave Revels. Recorded at Take Five Studios, Elizabeth, New Jersey, from April  July 2010. Engineer: William Weist. Edited and mixed by William Weist. Mastering: Fernando Martinez. Estudio MOMA, Buenos Aires, Argentina . Photography by Joachim”Jochen” Becker. Package design by Al Gold. Executive Producer: Joachim “Jochen” Becker.